This is our third year at Swingapalooza – and even though we were pretty exhausted already from our latest dance marathon, we knew that we would have a blast no matter what. I don’t know what it is about Swingapalooza. It’s not held anywhere huge – it’s in Gonzales, Louisiana, just outside of Baton Rouge. It’s not held in a fancy hotel. It’s not a big event. Inspite of those things, or perhaps it’s more because of those things, it has that hometown hospitality feel, where everyone is a friend and everyone is there is have some FUN! I’m sure that there is some drama – I think that just comes with the territory – but it never permeates the ballroom. There is very little negativity at this event. Everyone really cheers for one another and even though this is a competition weekend, I always feel like people want everyone to do well. There is a real sense of comraderie at this event like no other. Our Louisiana dance family grows all the time and I can’t thank them enough for welcoming us every year. I am so glad that we were able to bring a couple of Swingapalooza newbies with us this year and happy to say that we introduced them to such a wonderful event! A special thank you to Louie (1st in proam novice!) and Matthew (3rd place proam Intermediate and 5th place in our proam routine!) for helping me get Top Female Teacher this year! AMAZING! Truly unexpected and SO so so appreciated. I was thrilled to get to share the top honors with the phenomenal Matt Auclair! Also a shout out to Alan, for his first WCS competition ever! and then coming in 3rd in the newcomer J&J!!! GREAT JOB! and I love the new sense of confidence in your dance! It’s been fantastic watching you grow in your dance and I look forward to watching it continue to progress! 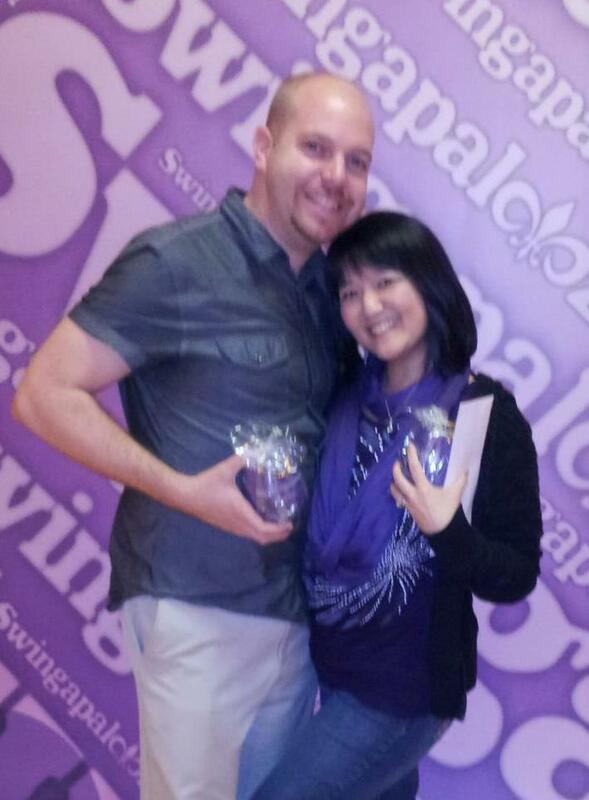 Thanks again to Bryan and Catrinel for another amazing Swingapalooza! 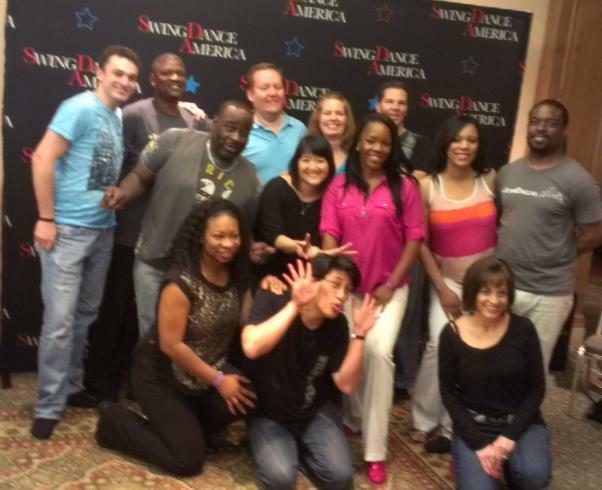 Next in our dance marathon trifecta was Swing Dance America at the beautiful Lake Geneva Resort in Wisconsin. It had been 4 years since we last attended, with lots of fond memories. We weren’t really sure what to expect this time, but since we were traveling with Chip and Janice, and we knew we’d get to see alot of our dance friends, we were pretty excited! After a super early flight into Chicago, we all rent a car and drive the 90 minutes to Lake Geneva. It was just cheaper for us to do this option then to fly into Milwaukee and then take the shuttle in. Plus, we knew that this was an event that we would want a car to drive to the grocery store and for some amazing Wisconsin pizza! All that delicious Wisconsin cheese! The resort is really nice, but difficult for dancers sometimes, since it’s laid out with multiple connected buildings. Our hotel room ended being pretty much as far away from the ballroom as one could get, with lots of stairs to negotiate. With ProAm Routines, Rising Star and Masters Routines, all in the same night, back to back to back, Chip and I were really worried about how we were going to do costume changes. His is easier of course – mine involves a change into a full corset! So Friday, we get there, and we run into one of our favorite people, Barry Jones. He has been so encouraging and a great cheerleader for us. After chatting with him a bit, he asks me to be his assistant in his two workshops over the weekend! WOW! Naturally, I had to jump on that opportunity, even though that meant missing out on a trip to the pizza place and less sleep. I didn’t care. Working with Barry is so amazing and I was so honored that he wanted me to assist him! The two workshops were so fun – and there were several people who called me the “lady that teaches with Barry” later in the weekend. Heh. So great! Thank you, Barry! The only competition we had going on that night was our Advanced/All Star strictly swing – which Trent and I decide to go ahead and dance together. We like to do that when we are traveling, while we tend to find different partners when we dance locally to change things up. We had sizzling prelim dances, which got us a lot of compliments. SO sweet! And then we made it into finals, which we were thrilled about. After all, we are virtually unknown in that region since we had not been in such a long time. It was GREAT to be noticed. I think we ended up in 7th or 8th, which amongst that crowd, I could not really complain too much. Saturday was a long long long long day. Floor tryouts at 7:30am with both Matthew and Chip, followed by teaching with Barry at 9am and a judging seminar that he asked me to attend as well. The workshop was fun, although since it was an advanced level workshop at 9am, we did not have very many people. I did however, get to meet Clayton, who was kind enough to let me borrow his room for my costume change as he was actually very close to the ballroom! Thanks again, Clayton! There were 2 judging workshops, but I only attended the first. I was desperate for food! But the one I attended was a seminar on how the relative scoring system came about and how and why it works. They had some technical difficulties with the AV equipment, but I thought the seminar was really good. I have a pretty good understanding of how it works, but it was the first time I heard how it came to be and why it is the best system for judging our type of competition. We also were given handouts with everything that was talked about, as well as examples for us to really see how things work. I thought this was a valuable workshop that any competitor should check out. Comps started early on Saturday, since there were SO many events to get through! I think proams started at noonish – with 3 levels of Ams in both Swing and Hustle. Then all the hustle strictlies and most of the swing strictly prelims (all levels other than the Adv strictly from the night before). Then 3 levels each of hustle and swing J&J. Not to mention, all the routine divisions except for showcase, which was on Friday. So Proams, Rising Star, Masters, Classic and then Teams. And finally Champions Strictly. It was a LOT to get through in one day. I heard that there were issues, but don’t know what they were. Things seemed disorganized and every category ran late. One of the biggest issues, we felt was also the use of “blocked time” on the schedule. For instance, on Saturday with the routines, it just says 8pm: Pro-Am Solo Routines, Rising Star Routines, Master’s Routines, Hustle Routines, Open Classic Dvision. I understand that it’s hard to know how many couples you may have in any given division, but those people in the Classic division, for instance, still had to show up early since they didn’t know when they might be starting. I felt really bad for the Classic couples – at least my 2 divisions were the first two. But there were many of them already in costume standing the ballroom, waiting through 12 proam routines, 6 rising star, and 4 masters routines. Since it said that routine divisions started at 8, many of us were down there by 7:30pm, but then routines didn’t start until closer to 9. by the time the classic division was run, many of those couples had been down there for 2 hours, just standing or sitting. I felt that it made for a few lacklaster routines. Not that they were bad by any means, but you could just feel a little less energy. Not just in the competitors but in the audience as well. I hope that this issue is resolved in the future. This was the biggest issue – otherwise, we thought the event was pretty fun and entertaining. It made me sad that we had to miss awards. We specifically booked the latest flight we could find so that we could stay for the awards as scheduled. But since they ran so late, we had to leave. We found out on our drive to the airport, that me and Chip won 1st in the Rising Star and that Trent won first in All Star JJ. It would have been nice to be there for people to see our faces and associate us with these prizes. Oh well. Maybe next time! As I said, this is a fun event ( I even got to try out my baby hustle skills!) with tons of really good dancers and some interesting comps and seminars. But the disorganization and the lack of communication with the competitors was a sore spot for many of us. We’ll be back, because we enjoy the event. Hopefully the issues this year were the exception. It’s been a whirlwind couple of weeks, with back to back competitions. First, Chicago Classic! This was our first time at this event, which always makes us a little nervous because you just don’t know what to expect. This was also a particularly challenging one for me, as I was doing both my new Pro-Am routine with Matthew Boehm, as well as my Rising Star routine with Chip, back to back Friday night. Which means, an extra early flight to get to the hotel in time for floor tryouts and not a whole lot of time for preparation. It was GO time! I really liked the hotel at the event, atrium style, which means that all the rooms overlook the lobby all the way down the center. Which is particularly fun, when you open your hotel room door from 7 floors up and can still hear Kellese’s voice below. 🙂 The restaurants in the hotel had some great food too. So even though it was hotel priced, at least we really enjoyed it! It’s been a whirlwind lately around here and it’s taken some time to get my thoughts together. This is our 3rd year taking part in Barry and Johnny’s super fun Challenge. This year, the event director was Michael Stephens and he did a great job in having a lot of versatility in the workshops and some fun contests, like the Two-Step jack and jill and a Century Swing (where the age of all the competitors in each dance couple/group has to add up to at least 100). Houston Rocks was also a new experience for me because I was asked to MC! Friday night was kinda crazy because I really wasn’t expecting to have to do that and I really was winging it. I think I was getting more into the groove of things and on Saturday, I had made myself an outline and it went better. I even got some nice compliments and some good constructive criticism. Who knew? Next up was our trip to Ohio for anniversary, Thanksgiving with the inlaws and of course, C.A.S.H. Bash! I think I have finally recovered (mostly) from my back to back dance convention weekends! And I think maybe I have even collected all my thoughts from this last weekend at Michigan Classic. This was our first time at Michigan Classic and Doug and Lori Rousar’s first time as event directors there. I always get a little anxious heading into a new event, especially out of our region because I feel like we don’t know very many people and you just don’t know what the atmosphere is going to be like. Well, I shouldn’t have worried! Doug and Lori definitely know how to keep a good energy level throughout an entire weekend, starting with the opening ceremonies (see my other post with the video)! Friday night started with Pro-Am and masters routines and the Pro J&J. I believe there were 14 couples in the pro-am routine division – that is phenomenal! Followed up by 5 very enjoyable Masters routines! I truly enjoy watching routines as they represent so much to each couple out there. Kudos to everyone who put in the time, energy and money to show us your joy of the dance! So Trent started this blog a year ago with the opening post about Swingapalooza last year. I am SO glad that we were able to attend again this year because it was an even bigger blow out than last year! Bryan and Catrinel Jordan did a truly amazing job at putting together one of the friendliest events ANYWHERE. One of the highlights of the weekend was that they had a local Cajun comedian, John Morgan, MC the Saturday night exhibitions and Pro J&J events. He was absolutely hysterical and really just brought the energy in the room even higher than it already was. Here is Debbie Figueroa, chief judge for the weekend, doing a wee exhibition with John to start off the evening! I’ve had a couple of days to debrief and recover from the first annual ASDC event in Austin, TX. Trent and I were very happy to be able to support this new event, run by our friends, Angel and Debbie Figueroa and Rick Domalski! I had several people ask me how much I had to drink Saturday night, as they said I seemed very happy. LOL. Granted, I did have a few, but mostly I was just happy to be surrounded by my dance friends, old and new, getting to catch up with people, and getting some really good dancing in! I was in a really good mood pretty much all weekend. We both really liked the hotel – it’s in a good location with lots of things within walking distance and it was a nice hotel that wasn’t too expensive. The ballroom had plenty of room and looked great! We thought the event was well run with very few snafus, especially for a first year event. And I know that the event directors are already looking to see how they can improve for next year. The music was fantastic, pretty much all weekend, and I really enjoyed the majority of the competition music as well. The energy in the ballroom was just really high all weekend – I never really felt a lull. I don’t know how they did that, but it really was great to see all the smiling faces from everyone. We will definitely be back next year and we are looking forward to seeing it grow! EDITED TO ADD: I nearly forgot to thank my Ams for dancing with me at ASDC!!!! As always, I want to thank Matthew for dancing with me and trusting me as your pro. I want to thank Louie for dancing with me again – you are on your way up! And I want to thank Shane, my newest Am, for asking me to be your pro – Congrats on your wins this weekend! So we decided to go on vacation – and took a 7 day western caribbean cruise with Michelle’s parents. I have to say, I had a very good time. Lots of food (waaaaaaaaaaaay to much food)! Lots of drinks! And probably the biggest surprise – we danced every night! We knew that there would be live bands and we could probably find a place to dance while on the ship. We just had no idea how much dancing we would be able to do and all the people we would meet because of it! During the first full night at sea, there was a welcoming party on the main promenade. It was formal night so we were all dressed up and there was a pop/R&B cover band playing. When we realized that they were playing some excellent dance music, we found an empty spot of floor and started dancing! I think we danced a couple of songs and then headed off to dinner. That night after dinner, we decided to find that same band so that we could get in some more dancing to work off all the food we had eaten so far. While we were there, we saw another couple dancing to west coast swing. We were so surprised to find another couple that knew our dance, we had to go chat with them. I think they were from Colorado and they were there with a big group of dancers, who we kept running into all week. Many of the dancers were older, but we loved that they were all out there, doing waltz, foxtrot, two step, swing, just out there getting their groove on! Throughout the week, people kept stopping us on the boat to tell us how much they enjoy watching us dance and if we knew where they could take lessons from their part of the country. We met couples from all over and by the end of the week, we were joking that we had groupies! They would start asking us when and where we would be dancing each night so that they could come join us to dance and to watch. I can definitely see the appeal of cruises and especially of going on a dance cruise! I think we’ll definitely be looking into a dance cruise in the future. Any recommendations?